Sign up with your email address to receive news and special offers from North Star Rugby! To see the program and register, click here. North Star Rugby is sorry to announce that our Youth Flag Rugby program is postponed until the spring of 2020. We are really sorry for the inconvenience. Sunday, April 3 to Sunday, June 7, 2020. Kids in grades 4 to 7 learn rugby skills through fun games and drills for 45 minutes and then play three 15 minute games to practice the skills they just learned. From those who are just new to the game to those who have played before, it is all about enjoying the game and having fun with old and new friends! Kids are divided into learning groups based on age and skill so everyone is a very active part of every session. For Girls in Grade 5 to 7 and Grades 8 to 10. Learn to play the fast and exciting game with experienced coaches in a fun and no-pressure session! Led by Mimi Appelbe and her team of coaches, this session is a great way to get to know how to catch and pass (yes, it is different!) and other great parts of the game. North Star Rugby goes MLR! North Star Rugby has taken the bold step to position group to be involved with the inaugural season of Major League Rugby's Seattle Seawolves. More news to follow! The 2017 editions of the North Shore 7's Rugby Tournament & Seven Skills Camp were not able to be launched this year for a host of reasons. We are quite disappointed as many within the Lower Mainland, BC and Western Canada were looking forward to what has been considered a "great way to launch the fall season of rugby." Please stay tuned for news as we begin planning for the 2018 North Shore 7's and Sevens Skills Camp. North Shore Flag 7's Rugby is ready to go! As reported below, North Star Rugby is supporting the launch of the first Flag 7's rugby program on the North Shore! For boys and girls in grades 5, 6, 7 and grade 8, this will be a fun and dynamic way to get out and learn this great sport! Half the time is spent learning great skills from qualified coaches and the second half is all fun and games! North Star Rugby (NSR) is in partnership with the Vancouver Rugby Union (VRU) to do a Flag Rugby pilot program in North Vancouver starting in April of 2017. Brock Turner, Vice-President at NSR is co-leading the project with Mimi Appelbe, VRU Rep coach and Head Coach of the Handsworth Royals Girls 15's program. "It is key to start touch and flag rugby projects if we want more boys and girls to play the sport," says Appelbe. "It is a fantastic sport for boys and girls of all shapes and sizes because it is an inclusive sport by its very nature. This pilot project is to show how easy it is for all kids to play rugby." The program combines skill acquisition sessions with games. Turner says, "One of the ways to create skilled players is to have fun, low-pressure skills sessions coupled with fun, easygoing games. The kids can experiment with what works and what doesn't but also they get a chance to be creative and innovative. That creates great enjoyment and keeps them coming back for more!" Stay tuned for more information about the VRU Touch/Flag Rugby Project powered by North Star Rugby! North Star Rugby has partnered with Canadian national athlete Barbara Mervin and her APTOELLA brand on a range of clothing to be debuted by the Aptoella North Stars at the North Shore 7s festival being held at Capilano RFC's home ground of Klahanie Park from the 11th - 13th of September. Barbara Mervin will be coaching the Aptoella North Stars team (U16-U18) and she kicks off the festival on Friday the 11th of September with fellow national athlete, Adam Zaruba, coaching a sevens skills clinic from 4pm at the same venue. North Star Rugby's Vice-President, Emma Tucker, is the project manager alongside APTOELLA and is excited about the range: "We've been wanting to work with Barbara for some time - she's a smart and dynamic advocate for women's rugby and APTOELLA is way out in front in terms of identifying the points of difference that women look for in their apparel. We've had a very strong response this year from women's teams wanting to take part - the APTOELLA North Stars are drawn primarily from new rugby athletes living on the Sunshine Coast and who got involved with rugby at North Star development camps at Chatelech School earlier this year"
North Star Rugby will be launching its online store very soon! SOLD OUT!! SKILLS CLINIC WITH ZARUBA AND MERVIN KICKS OFF NORTH STAR'S NORTH SHORE 7'S FESTIVAL ON SEPTEMBER 11TH AT KLAHANIE PARK. The North Shore 7's festival looks set to kick off in style in Friday 11th of September with a SOLD OUT skills clinic featuring guest coaches - national team athletes Adam Zaruba and Barbara Mervin. 80 young athletes will work with the coaching team for over two hours. North Star Rugby's Chief Operating Officer, Daniel Weidner, said: "We're delighted that this showcase skills clinic has sold out so quickly - it shows the enthusiasm and demand for this sort of innovative, development based event. When we met late last year with Graham Brown at Rugby Canada we shared his view that there should be increased opportunities for national level athletes such as a Adam and Barbara to work closely with youth players in this way and we're following through on North Star's commitment to that idea." The founders of North Star Rugby revealed today that after a number of weeks of discussions they had concluded a deal with highly experienced sports development professional, Brock Turner. He joins North Star at a crucial time in its growth and has been given a free hand to drive the company’s success in BC, across the Country and into the United States. In over twenty years he’s held key positions in a wide range of sports organisations and is currently Vice –Chair of Sport BC and a director of the Vancouver Sport Network. A former Olympic-style, championship wrestler and lacrosse player he’s also an accomplished coach in swimming, wrestling, hockey and lacrosse. North Star Director of Rugby, Curry Hitchborn was equally delighted: "Brock has sport running through his veins. I’ve seen Brock’s involvement in rugby as a committed and supportive parent and volunteer for some time. Gaining his passion for the growth of the game and being able to leverage his background in sport development are great strides forward in North Star’s development. Brock brings a realistic approach coupled with a focus that will push rugby to not only grow from within but also attract new interest from athletes in other sports along with new investment"
Mr Turner, originally from Saskatchewan is a longstanding Vancouver resident and lives with his wife and two children on the West side of the City. As you’d expect, both his children are active athletes. His son, Sam, plays rugby for St Georges School, The Vancouver Rowing Club and BC. Special guest coaches to kick off the opening day of the North Shore 7s festival have been confirmed by North Star Rugby. Canadian national sevens players, Adam Zaruba and Barbara Mervin, will lead North Star’s skills clinic at Klahanie Park between 4pm and 6pm on Friday the 11th of September. 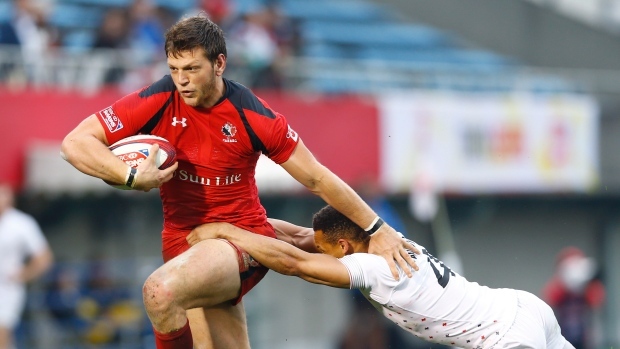 Zaruba’s try against England in Las Vegas earlier this year took Canada to victory in that game and Mervin was a member of the Canadian cup winning team at the same tournament in 2012. Mervin is also the founder of women’s clothing brand APTOELLA which will be at North Shore 7s throughout the weekend of September 12th and 13th showing their latest range of apparel. North Star Rugby invites you to the North Shore 7s Skills and Development camp for Men and Women U14 to U18 from 4 pm to 6 pm on Friday September 11th at Klahanie Park. The cost of the camp is $20 per player or coach, or $150 per team of 12 players and will include a T-shirt for each player. The camp will focus on technical and tactical game play and core skills specific to Rugby 7s. More information about North Shore 7s 2015 can be found at www.northshore7s.com or by emailing info@northshore7s.com and registration for the event is now open. There's only one week remaining for your team to get the early bird entrance fee of $200 for this year’s North Shore 7s. …. And in just four weeks we'll kick off our second North Shore 7’s tournament on the weekend of September 12th and 13th. It will be even bigger and better than last year! Spots are filling up fast, especially for our travel and accommodation packages, so sign up now! We start our festivities on the evening of Friday Sept 11th with a training camp featuring top-level guest coaches to help with your final preparation for the tournament. Please contact us for further travel and accommodation inquiries as well as camp and tournament registration. The innovative selection process used by North Star founder and BC U16 Head Coach Danny Weidner and his team was proved effective at the Western Championships in Kelowna winning both games against the Prairie Wolfpack made up of athletes from Alberta, Saskatchewan and Manitoba. The first match was hard fought with Weidner's team coming out on top, 27-14. After a day off to recover the scoreline in the second match widened to 44-0. The preparation for this success took place at a week long selection camp at Klahanie Park where Weidner pitched his squad against the toughest opponents he could find in the form of Salty Thompson's Eagle Impact Rugby Academy from the USA and St Peter's School from the UK. Weidner said of the Kelowna results "We have to give full credit for the results here in Kelowna to our rigorous selection process which saw us invite close to 100 athletes to a week long camp. In previous years there were two BC teams competing at the National Championships. We felt it was imperative to be inclusive and to give as many athletes as possible not only an opportunity to make the BC team but to also learn and improve from a high level of competition and training. As the results show, playing the best possible opponents ahead of the Western Championship gave our players a different perspective and determination"
North Star Director of Rugby, Curry Hitchborn, also assisted with the BC U16 team in Kelowna fresh from winning the Canadian Rugby Championships with the BC U19 men's team in Regina. Hitchborn said that "Playing against the Eagle Impact Rugby Academy certainly helped prepare the team moving into the Western Championships. Through the PRC's regional coaches did an outstanding job prepping their teams and individual players to the highest level available to them as well." Working with High School All Americans Head Coach, Salty Thompson, North Star Rugby staged two thrilling matches between the Eagle Impact Rugby Academy and the BC U16 North Star Selects during BC Rugby's U16 provincial selection at Klahanie Park. With over 70 BC athletes attending the week long camp North Star founder and BC Head Coach, Danny Weidner, found immense success with these challenging games helping to select 24 athletes to travel to the Western Championships in Kelowna. Weidner's coaching team will have some tough decisions to make and will announce their team in the next few days. North Star Rugby will now look to set up a home and away series of games with EIRA. Working alongside BC Bulldog's Head Coach, Luke Gray, and Canada Wolverines U19 Head Coach, Andy Blackburn over 70 U16 players benefited from training with the New South Wales Tertiary Students Rugby League team. The event was organised by North Star Rugby whose Chief Operating Officer, Danny Weidner said "The skill sets learned from these high level rugby league players greatly improve and compliment the handling and running lines used in both codes. This great opportunity was invaluable to the athletes that attended the session. As part of the regional development programs being launched by North Star Rugby in the coming months rugby league coaches will play a substantial role in helping young athletes to improve their skill sets." North Star's Director of Rugby, Curry Hitchborn, added another success to his impressive track record with another gold, this time with the BC U19 men's team at the Canadian Rugby Championships in Regina, Saskatchewan. Hitchborn's team beat Ontario 11 - 8 on a windy day in the Prairies. nORTH sTAR RUGBY u18'S CELEBRATE AFTER WINNING THE PLATE AT THE VICTORIA INTERNATIONAL SEVENS. North Star Rugby was well represented at the first weekend of the PRC tournament in Vancouver. We sponsored 11 teams and had many North Star coaches working closely with Vancouver Rugby Union men's and women's teams from all Vancouver regions and age grades U14, U15 and U16. Winning medals and placing highly across all the divisions, our teams came away with 2 gold, 4 silver and 2 bronze. This coming weekend will be the U17 and U18 men's and women's turn at the PRC's. North star will again be well represented by 6 competing teams across 3 divisions. The present and future of rugby look to be bright at Chatelech Secondary School. On Wednesday, April 1, an inaugural girls’ camp was held with 14 players on hand, most of whom had never picked up a rugby ball before. In the afternoon, a boys’ camp was held, the second such camp in recent weeks. Both camps were hugely successful and will continue to help bolster Chatelech’s program, according to coach Drew Murphy. On hand for the April 1 camps were Curry Hitchborn, director of rugby for Northstar Rugby. He is also a forwards’ coach for UBC, a U19 provincial coach and a guest national coach for age-grade rugby. Also helping out were Luke Gray, a professional rugby player with the ACT Brumbies, and Daniel Weidner, a former national age-grade player and U16 provincial coach. Hitchborn was more than a little impressed by the level of commitment, passion and desire shown by the female players in the morning camp when Coast Reporter paid a visit just an hour into the session. Hitchborn had the opportunity to play against the Gibsons Pigs years ago, so he knows the Sunshine Coast has a passion for the sport. Throughout the morning, the coaches led the players through a series of basic skills including catching, passing, rucking (which is maintaining your own ball) and tackling. “We are not doing a lot of tactics; we are just doing basic technical skills and then end the day with a sevens tournament,” Hitchborn said. In the afternoon, the men’s camp touched on some of the basic skills, but since a lot of that was covered at the previous camp, the coaches put the players through more game play. “Rugby is a unique sport like that because the best way to learn is to play,” he added. Murphy said plans are to continue to grow the girls program and get connected with national-level female coaches for more coaching sessions.